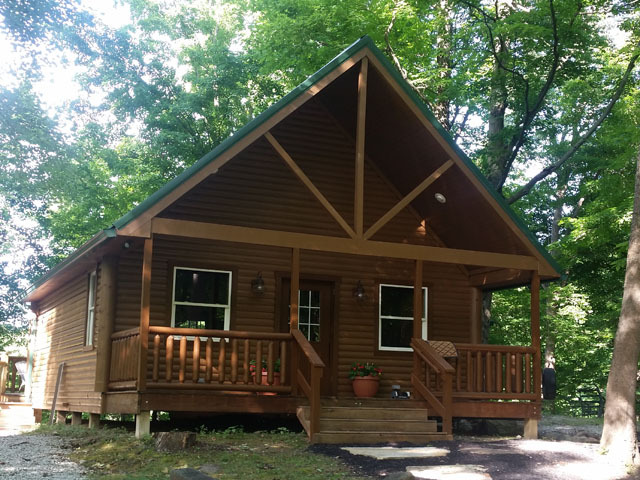 The Sycamore Hill Cabins are located in a wooded setting, 1.3 miles from our canoe livery, and are made up of a main cabin and a bunk house. The main cabin has a sleeping area for 4 people in the loft that overlooks the family room area. It also has a small kitchen (you will need to bring everything for cooking), dining area, large deck, and bathroom (shower only, no tube). It is outfitted with electricity, window air-conditioning , microwave, refrigerator, coffee pot, beds, porch, fire-ring, charcoal grill and picnic table. Bring everything necessary for camping exept the tent! Non-smoking. Requires a two-night minimum; holidays require a three-night minimum. The cabin season Mid-April - Mid-Oct. Pets are not allowed. For groups who need or want more space, the bunk house sleeps an additonal 4 people. It has 2 sets of bunkbeds, mini refrigerator, electricity and window air. No bathroom. These cabins are surounded by private property. No woods access and no access to the creek. Please respect private property rights. Rental options: Main cabin only or main cabin with bunk house. Please specify which option you would like to rent. Reservations are recommended. Refundable Security Deposit and	signed Waiver required at check-in.